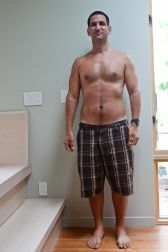 Learn how Couch Surfing Ori went on a raw food weight loss plan and lost 28 pounds in 30 days. He reveals quick weight loss tips with raw weight loss smoothies! Ori decided to take up a challenge and eat all raw for 30 days while on a road trip with his friends. 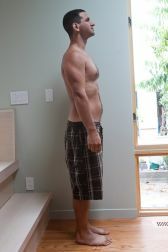 Ori shares what he learned along the way on his 30 day raw food diet. 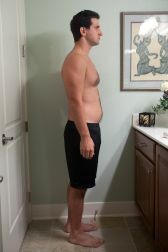 How did drinking smoothies help you lose weight during your 30 day raw food weight loss plan? Ori: The diet was a 30-day raw food diet. Nothing cooked could be used. Smoothies were a way of getting nutrition that tasted good (no offense veggies). The smoothies were not the same as just biting into a fruit, as we added all sorts of natural supplements to them. Since they were real smoothies (not just "add powder + water), they contained fiber, which helped keep me full. Since smoothies are like art-- each one is an unique creation - we were able to have a very distinct variety of flavors. Lack of variety is one thing that can kill a diet. How were your energy levels on this all-raw diet? Ori: My energy levels were pretty great during my raw-food diet. 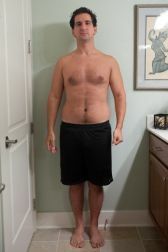 I was happy because of the weight loss (which the scale noticed very much within a week), which gave me more confidence, and thus more energy (from the psychological standpoint). I also did not require nearly as much energy for digestion of raw foods, versus my usual cooked foods and meats, so I had more energy. I also treated myself to full nights of sleep during the 30 days (usually, I'm a workaholic, and skimp out on the sleep). The motivation provided by seeing results made me start jogging - a process that started out quite pathetically, and grew into me running 13 miles in one session. Do you still drink smoothies on a regular basis? Ori: Unfortunately, no. I wish I did. I was just at a cosmetics tradeshow (I visit all sorts of tradeshows, as a consultant it is good to see what people are doing in various industries), and VitaMix had a booth... I kept visiting for their delicious fresh smoothies. What was your favorite smoothie recipe? Ori: They are so varied.... I have a journal full of what went in each one. I believe that young Thai coconut meat and milk, with honey, MSM, cacao, bee pollen, mango, spring water, and peaches was one of them. You took a lot of different raw smoothie supplements. Which one was your favorite? Ori: This video is just one of the smoothies we made in the 30 days. Craig Allen is actually involved in the raw food community, and was the one who introduced me to it. He was our smoothie maker -- and never travels without his blender. I have to be honest, I think Cacao is my favorite supplement - it gives you energy, focus, is an appetite suppressant. But, I've heard that it is also slightly addicting, and can develop side effects. I heard that from a person who took a spoon full daily for over a year. What would you say is the key to losing weight with smoothies? Someone wanting to lose weight would do well by trying smoothies. They pack a lot of nutrition in a single serving. Having a good blender helps (if you include the peels, you get a lot more fiber, which helps keep you full, and helps digestion). Adding natural supplements helps. Make sure to vary things up. But if you're looking to lose weight, make sure to not have just sugar-filled fruit and nothing else. Sugar is sugar, calories are calories, so choose them wisely. Is there anything else that you would like us to know regarding a raw food weight loss plan? Ori: A few things that will help you stay on a diet. 1) Have someone to diet with, or at least to support you and hold you accountable. 2) Keep things varied! If you get bored with your food, you will drop any diet you're on. Try local meet up groups for example. Ori, thank you so much for sharing your raw food weight loss experience with raw food and smoothies. I have been on an all-raw vegan diet a couple of times. My energy levels really soared to new heights. I even woke up before my alarm clock in the mornings! Now... that is telling you something! Raw food is much easier for the body to digest as the heat sensitive enzymes are still intact. If you aren’t willing to go on an all raw food weight loss plan as Ori did, why not try eating all raw food one day a week? Our bodies need a break from all of our unhealthy eating habits. You could even drink raw smoothies all day long! Now, how hard would that be? Consistently adding raw food, like veggies and fruit, to your current diet for the rest of your life is better than eating all raw for a short time and returning to all cooked meals. So incorporate as much raw food into your diet that you can.